The firm, who have been receiving business support both through the Sustainable Technologies Business Acceleration Hub and the Digital Innovation Business Acceleration Hub, have designed a patent-pending system with a growth rate of more than 70% compared to existing methods of growing leafy greens, salads and herbs. The system uses aeroponics instead of soil, meaning plant roots are suspended in a nutrient-dense mist. This results in faster growth rates as well as consistent and predictable yields and a 95% reduction in water usage compared to open-field farming. It also eradicates the need for pesticides or herbicides and massively reduces the environmental impact of delivering food from farm to fork as the ‘farms’ can be based in urban locations. Nearly £400,000 of the investment has come from Innovate UK, the government’s innovation agency, to lead a £700,000 project aimed at increasing food resilience and security in the face of climate change. 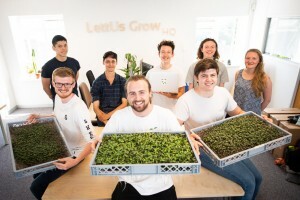 LettUs Grow will work with ECH Engineering, based at Winford, near Bristol, which is an industry leader in controlled environment technology, and urban agriculture experts from Grow Bristol. A further €100,000 (£89,600) has been received from the Green Challenge, which is funded by lotteries across the world, and several additional research grants. These grants came hot on the heels of the LettUs Grow’s most recent investment round, when it raised £460,000 from London-based impact investors ClearySo, Bethnal Green Ventures, the University of Bristol Enterprise Fund II, managed by Parkwalk Advisors, and a group of angel investors. LettUs Grow co-founder and managing director Charlie Guy, pictured above, centre, with the LettUS Grow team, said: “This injection of private and public funding into the company enables us to accelerate our innovative products to market and build one of the most technically advanced facilities for indoor growing in the world. ClearlySo investment manager Matias Wibowo added: “Innovation is critical to ensuring long-term food security and sustainability. Our investors see the value, both in terms of financial and environmental/social returns from tackling this systemic global problem. “That’s why they got involved in LettUs Grow.